The Next Mega-Trend in Crypto is the Emergence of Securities Tokens. A form of blockchain fundraising called an Initial Coin Offering (ICO) has existed since July 2013. Over the last two years, the ICO model has been used by hundreds of organizations to raise more than $3 billion USD. Government agencies are now analyzing the securities implications of this non-traditional form of financing, with potential consequences for ICOs that violate securities laws. 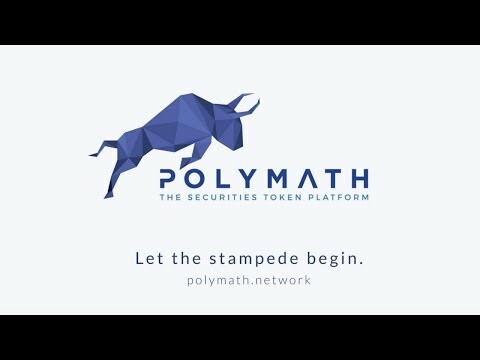 We present Polymath, a protocol to facilitate the primary issuance and to restrict the secondary trading of blockchain security tokens. Polymath uses a blockchain-based protocol that provides a suite of tools to coordinate and incentivize participants to collaborate and launch financial products on the blockchain. By creating a standard token protocol which embeds defined requirements into the tokens themselves, these tokens can only be purchased and traded among verified participants. Strong and experienced team. Could improve on their marketing. Solving a real problem with few solutions.